Japanese scientists have discovered new information about how the myelin sheath is repaired following damage. Myelin is a fatty substance that wraps around nerve cells and helps them to conduct impulses. The research could have major implications for how multiple sclerosis is understood and even treated. The study, titled “Inactivation of Protein Tyrosine Phosphatase Receptor Type Z by Pleiotrophin Promotes Remyelination through Activation of Differentiation of Oligodendrocyte Precursor Cells,” appeared in the Journal of Neuroscience on September 2, 2015. The symptoms of multiple sclerosis are due to an immune attack on the body’s own myelin. When myelin is lost around nerve cells, this can cause unpredictable loss of movement, sensation, vision problems and feelings of pain. Myelin is made by special nervous system cells called oligodendrocytes. 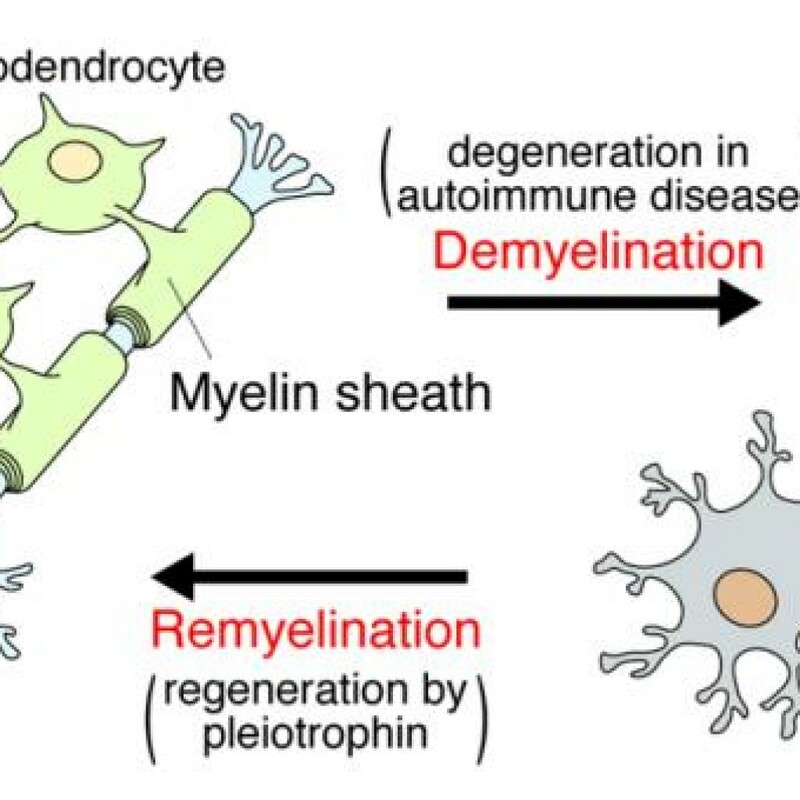 Although it is well-known that myelin can be repaired by oligodendrocytes if it is damaged scientists do not understand the exact repair mechanisms used by these cells. In MS, myelin unfortunately does not appear to be easily repaired, also for unknown reasons. The researchers, led by Professor Masaharu Noda and colleagues of the National Institute for Basic Biology, wanted to study how myelin is repaired in mice with an experimental form of MS, induced by the myelin-damaging drug cuprizone. They studied both normal mice and genetically-altered mice that lacked protein tyrosine phosphatase receptor type Z (PTPRZ), which is a protein that may cause oligodendrocytes to turn into mature cells, rather than stay in a more immature stage. Following loss of myelin with cuprizone, the mice that lacked PTPRZ had more myelin repair than the normal mice. The researchers also found that a protein called pleiotrophin (PTN), seemed to be associated with remyelination in the mouse brains, suggesting that it may inactivate PTPRZ. When studied in vitro (in a dish), oligodendrocytes treated with PTN turned into a form that creates new myelin. Overall, the study suggests that pleiotrophin is secreted by nerve cells when they are damaged and lose myelin, and pleiotrophin3 then inhibits PTPRZ. This allows oligodendrocytes to create new myelin. The new understanding of how myelin is formed could provide the basis for new MS treatments, for example, drugs that inhibit PTPRZ or that increase pleiotrophin might be used in the future. Of course, much more research is needed and the investigators will need to find new compounds that act on PTPRZ.